Posted on Mon, Mar 19, 2012 : 5:52 p.m. Note: This article as been updated to reflect McKinley Inc. attempted to contact each displaced resident. 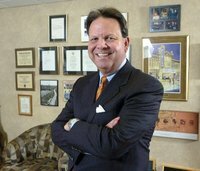 The seven families living in Park Place Apartments and displaced by flooding there during last week's storm can return to their homes in three to four weeks, said Albert Berriz, CEO of McKinley Inc.
McKinley employees have attempted to contact each family to offer another unit at other McKinley properties, said Berriz. Two families accepted the offer, and the remaining five have been contacted to make arrangements. "Everybody was given a chance to relocate to a different community right away," Berriz said, adding if the families would like to return to their previous unit, they will be able to do so. "Anybody who wants to do that is welcomed to. We are under construction already. The construction team is in full force." Berriz said 28 families living in a McKinley property were affected in some way, but only the seven families required relocation. About four feet of water flooded Park Place, destroying property and flooding the parking lot. A dog was found dead inside one of the units during the flooding. McKinley Inc. established the Park Place Flood Recovery Fund to accept donations for the families affected by the flooding. Berriz said the fund has accepted "thousands of dollars already." "We want to be able to give the flood victims a check," he said. "That way they can make up for any lost possessions. Not all of them had renters insurance." Berriz said they will accept donations for as long as they come in, adding, "as long as we get them, we'll pass the money right back to the families that were affected. We've had great success so far." A checking account has been opened in the fund's name and donations can be dropped off at the Park Place/Hill Crest Apartments main office at 1980 Pauline Boulevard, said Berriz. For more information on the Park Place Flood Recovery Fund, call the Park Place/Hill Crest Apartments main office at 734-761-1897. Tue, Mar 20, 2012 : 3:36 a.m. It sounds like McKinley is doing good by those affected. Tue, Mar 20, 2012 : 2:55 a.m.
And what do they plan to do to improve the drainage around this building to ensure it doesn't flood again? Those exact same apartments flooded when I lived there in 2000, and I doubt that's the only other time this has happened. Even if it is only a once-a-decade problem, that still seems far too frequent a recurrence that I can't imagine how they could continue to rent them out. That lower level should be pulled from occupancy until McKinley figures out a way to improve drainage. Wed, Jun 20, 2012 : 12:39 a.m.
Hey there amlive, I would like to contact you regarding the flood at Park Place apartments in 2000. Please email me at japlihs@hotmail.com if you would be so kind. Wed, Mar 21, 2012 : 8:25 p.m. I think Mr. Berriz needs to check his sources. The water receded within minutes after someone cleared the debris from the drain on the lawn behind the flooded building. If the city's drainage system was backed up, as Mr. Berriz alluded to, clearing that debris from the drain on Mckinley's property wouldn't have made a difference. Secondly, a newer article says the woman whose dog drowned has not been contacted by Mckinley regarding replacement housing. Would you like to retract or clarify any of your statements, Mr. Berriz? Tue, Mar 20, 2012 : 10:40 a.m.
amlive... Thanks for your feedback. As you may know, the drainage is a city issue that seems to have gotten worse with the recent road improvments in the area. Having said that, as part of our reconstruction efforts, we are making a further significant drainage investment on our property, doing the best we can even though we can't control backups that occur from city storm drains in a major storm event like we had the other night. We have been working very hard since the flash food event occurred, and we are doing the right thing to protect our residents and our property in the future. Thanks for your input! Mon, Mar 19, 2012 : 11:09 p.m. I can tell that the floodwater didn't get to four feet in the parking lot, like it did on Snyder and Potter, but were the parked cars ruined? Most likely, none of those cars were rented. Tue, Mar 20, 2012 : 1:47 a.m.
That picture was taken after the flooding had already begun to recede a bit. 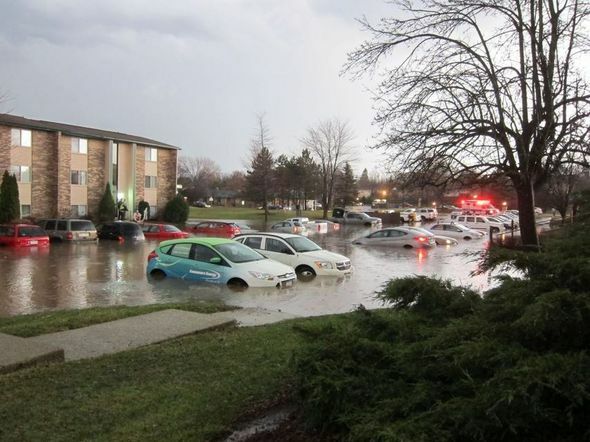 The majority of the cars you see in the picture were either damaged or totaled due to the water damage.